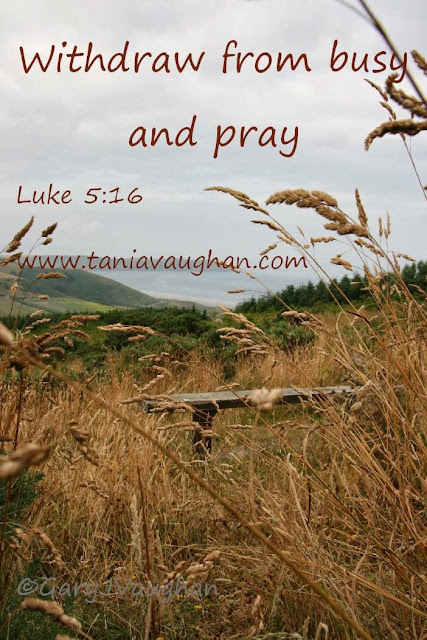 Tania Vaughan: Are you too busy to pray? If we are to follow his model of prayer then we are to withdraw to pray. As good as corporate prayer is and vitally important, in fact Jesus says that where 2 or 3 gather, there he will be, this does not replace time alone with God. Throughout Luke we see Jesus take time alone to pray and the importance of ‘going into your room and closing the door’ cannot be overlooked. Jesus instructs this to his disciples and to us in Matthew 5:5-8. In the midst of busyness, when the crowds are pressing in, when daily life is in danger of becoming overwhelming, these are the times when we need to take time on our own to pray. When we look at the account in Luke, these are the times that Jesus went to pray. These two verses highlight the importance of taking yourself away from the crowds ‘to lonely places’ and taking time out to pray. It is often a misconception that you can only get this depth of prayer if you get away for a day, go on retreat, remain in silence and away from all those you know. However this is not what Jesus models. He did take himself away, but not far away. He often prayed surrounded by his disciples Luke 11:1 tells us that when he had finished praying, one of his disciples spoke to him. Even when he came down the mountain in Luke 6 he immediately sought his disciples, in Luke 22:41 “he withdrew about a stone’s throw beyond them, knelt down and prayed.” There is a lot here to be said about the people Jesus had around him. Jesus is able to find stillness, a certain place, a way of withdrawing in a crowd that is a valuable skill to be learned. It is not always possible to find a place of solitude and silence, to get away from it all. Sometimes, all we have is our lunch hour, or the time between the kids leaving for school and the rest of the day starting, or time spent travelling. I have got into the habit of not having music on in the car, it is only a 10 minute drive to work, but I use this time to present my day before God, lay what’s on my heart before him. This 10 minutes of quiet is a way in which I have carved out a quiet time and place to take myself away to pray. Are there opportunities is the midst of the crowd when you can withdraw just a little to spend time with God?